Stella Mae (Joyner) Brown, age 91 departed this life Monday, January 21st, 2019 in Okemah, OK. She was born February 25, 1927 in Eufaula, OK to the late James Otis Joyner and Maggie Leona (Slay) Joyner. She worked for Seminole Hospital as a nurse. Stella had a host of nieces and nephews that she loved dearly. She had a host of friends. 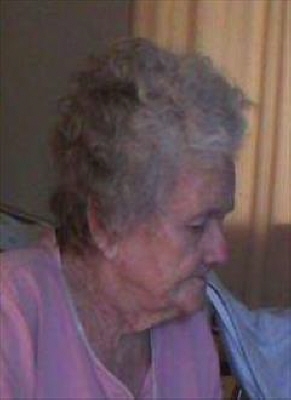 Besides being a nurse at the hospital she loved to read and do housework and take care of her family. She liked to collect rocks from vacations and make herself rock gardens. Stella helped her husband in the garden and would do canning. She enjoyed reading the inquirer. She loved to feed Tom the stray cat and take care of the two bird dogs. Preceding Stella in death are her parents, husband, son Billy Walker, sister Mary Alice Ramsey; three brothers Vaughn Joyner, Thomas Joyner and J.O. Joyner, sister Faye Smith. Survivors include children Janet Beene of Okemah, OK, Buddy Walker of Washington DC, and Judy Davis and husband Paul of Gore, OK: seven grandchildren, and nine great-grandchildren; one brother Roy Joyner and wife Stephanie of Henryetta, OK; sisters Shirley Meeks of Sulphur, OK, Sue Garner of Phoenix, AZ, and Jane Mathews of Seminole, OK and a host of other relatives and friends. Funeral service will be 1:00 PM Friday January 25, 2019 at Cowboy Crossroads Church, Okemah, OK with Pastors Greg Walker and Terry Edminsten officiating. Burial will be at Little Cemetery. Pall bearers will ber Judy Haney, Allie Haney, Greg Walker, Todd Rosson, Terry Edminsten, and Gary Evans. To send flowers or a remembrance gift to the family of Stella Mae Brown, please visit our Tribute Store. "Email Address" would like to share the life celebration of Stella Mae Brown. Click on the "link" to go to share a favorite memory or leave a condolence message for the family.